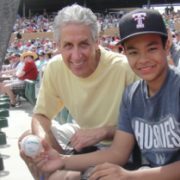 Last spring, CUBG sent Elijah Diggins, a young cancer survivor, and his family to Arizona for a dream trip to watch spring training baseball. Elijah recently celebrated two years of being cancer free and still keeps in touch with CUBG regularly. Click here for an updated article on Elijah’s story from the Northwest Credit Union Association. https://cubg.org/wp-content/uploads/2016/06/Elijah-Spring-Training.jpg 209 300 CU Business Group https://cubg.org/wp-content/uploads/2016/10/cubg-logo-4.png CU Business Group2015-02-01 17:47:132016-12-05 13:18:06Elijah's Story: "A Bad Dream Followed With a Lot of Good Stuff Happening"